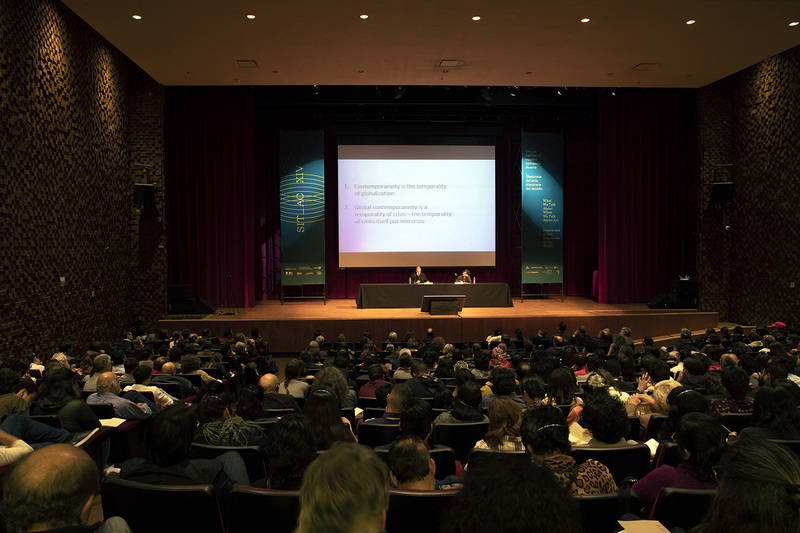 The XIV edition of the Simposio Internacional de Teoría sobre Arte Contemporáneo (SITAC) was held from January 17 to 19 of the current year. It was based in the Museo Nacional de Antropología e Historia of Mexico City under the title What Do We Talk About When We Talk About Art. Discourses of Art, Discourses of the World. Despite not having question marks, a question vibrates in that title. 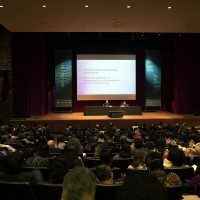 In the text in which João Fernandes (director of this edition) presents his statement as convener, as well as in the introduction and conclusions of the event, participants and assistants were invited to keep the question open. To use it as an excuse to come together, think, elaborate, re-think and re-elaborate as much as necessary around the issue of the specificity of art. The participants that undertake that excuse, in the discussions or in the audience, as observers or readers, we generate a series of scenes and conversations of which surely we have taken air or shed some light on some of the ideas that link each one of us to art. Air that refreshes or ravages. The light that lightens or almost burns. The second part of the title, although shadowed, seems also powerful to me. The audience, the dynamics and the format of the symposium were an indicator of what are the discourses of art and from which of the discourses of the world they were articulated through the various voices of those involved. I do not speak of voices as subjective opinions, but of tones, volumes, and velocities. The conversations with colleagues or not colleagues around the event are, both, discourses of art and discourses of the world; they are the variables from which the lecturers read the texts that they have prepared and they are the rumors that are heard while nobody is speaking into a microphone. Regarding the event, I think: Why did I attend the SITAC? Why did we all attend the SITAC? What discussions excite us? What discussions bring out that flavor that is already very familiar to us? Here I seek to extend the game convened by the event in its fragile pretense of invoking the most fundamental of art. On the one hand, I enlist a series of questions that I formulated around each one of the parts of the program and that I consider an echo to the initial question, intimately linked to the words and images that the speakers used. These questions are not so much an argument but a kind of consultation document that I can return to when I feel I have answers or that it is convenient to unfold new questions; in fact, many of my questions can be followed by one more: Why? I maintain the program’s schedule to avoid involuntary moments of emphasis. On the other hand, I suggest cultivating your own questions. To those who attended, to revisit the seen or the written. 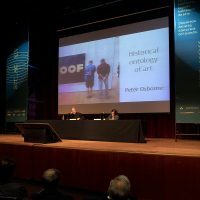 To those who did not attend, to review the archive, the video available on the YouTube channel of the Patronato de Arte Contemporáneo to see or write around the subject. To all, I suggest circulating your own questions, the others’, to undo them, reformulate them and, above all, to let them resonate. 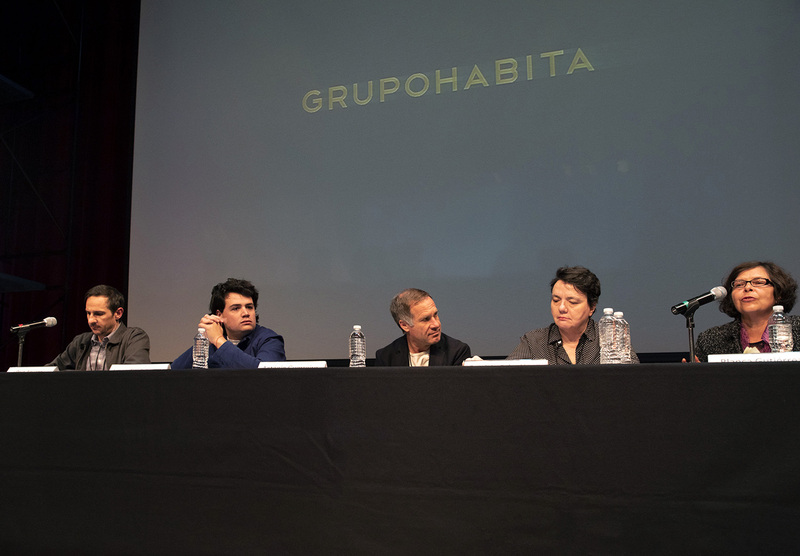 By the way, to the Patronato de Arte Contemporáneo (PAC), I recognize and greatly appreciate the organization and realization of the event, because, besides involving a lot of work, it is sustained by a cultural justification that remains extremely vague. What do I think about the title of this edition? How does the venue affect an art event? What would the other attendees be watching in the video of the fly that inaugurated the program ? 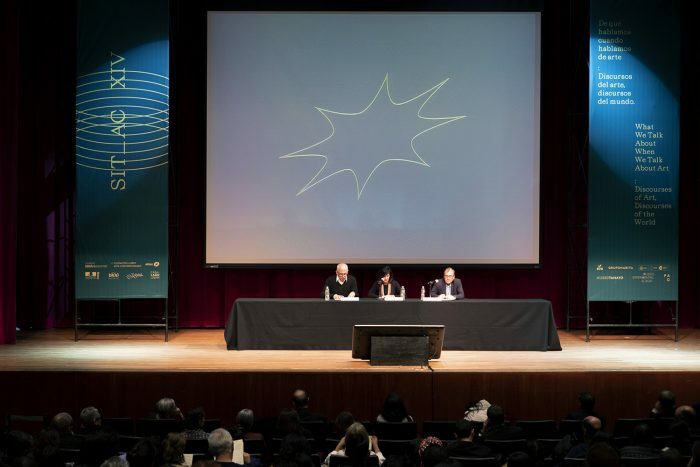 What are we talking about when we talk about neoliberal economics in art? What kind of presence does a work of art have now? Is there a crisis of critical discourses? What critical discourses do I know? What makes them critical? Could my interpretation of art go beyond my education? Can a work of art question an ideological circuit? What contaminates a work of art? Is it possible to be together and do nothing? What is singular and specific is free or radical? Can art be non-intentional? Is art history a fiction or a model of use? Does a collaboration necessarily have to be read as a gesture of resistance? Disclaimer: Osbourne warned that from his lecture we could not extract fully explanatory concepts. Can something non-historical exist? What is taught in art schools? Do they teach objects to be ontologically constituted in art schools? 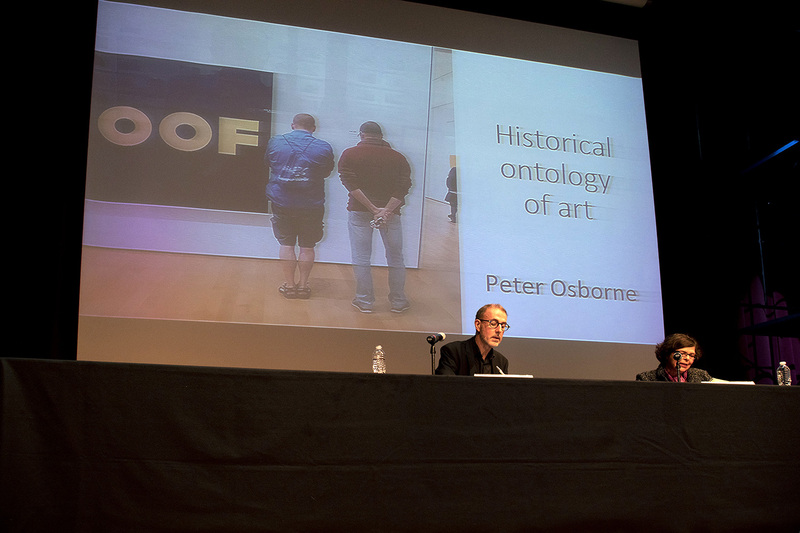 Is art a historical-ontological concept? 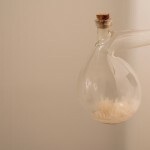 Is art a transdisciplinary concept? Is art a critical concept? Is the art multiplicity? What articulates art? To constitute is to co-produce? How to negotiate between multiplicity and its unity? In what does judging consist? Is it the same to judge that to value? Does contemporaneity imply a state of crisis? What is the post-capitalist imagery of which we participate? Can art claim its social independence? Does art resist being functional? Is art dysfunctional? Does art have its own rules? Is the experience of art, art? Is art experienced in images? What is the relationship between art and philosophy? Is a criticism a critique of reality or only of a discourse? What possibilities of art can be broadened? What distinguishes critical theory from philosophy? 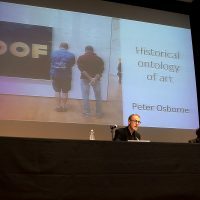 What distinguishes art criticism from other writings about art? To ask about something specific is to look for an exit? Is the critic a strategist? What objects of my research am I unfolding and which I am advocating? Does the artistic find more fertile ground outside the art world? To thematize an issue is to make it public? Is the art world governed solely by discursive principles? What is gained by announcing that we can no longer speak of art in general? In the search for the specificity of art, do we look for something very big or very small? What does an artist write? To talk about art, is it possible to have a permanent moral disclaimer? Does the artist legitimize the critic or is it the other way around? How do we update works that were important in the past for this present? How does the aesthetic form of an artwork coexist with its social form? Was Walter Benjamin’s critical work a bomb? Is the inorganic, glamorous? Are you betting on the question about art whether or not it belongs to a circle? How is art placed in front of the gaze? Are the senses circulating freely or are they imprisoned in significations? Does negativity cloud or complicate? Is art a lousy political promoter? Is art the herald of an impossible message? Has art questioned all limits? Is art, then, an intention that overflows? Is art a frontman? Does art expand the real? Is art barely verifiable? What has happened to modern discourse? Has the transition been transformed into tradition? What is reprehensible by the media is more memorable? Culture and social anesthesia are synonymous? Does absolute realism create indiscernible blindness? Is art a system of affectations? Is art a machine of symbolic propositions? Is art a hypothetical? Is there visual abuse? Can an artistic institution fall apart? Can an exhibition model be critical? Can you complain? Can a work of art anesthetize us? What art do I contemplate, what art do I study and what art do I disown? 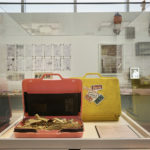 Can a museum be an archive? Can a museum be assumed as a temple? Is the museum a meeting point? Does a museum purify? Is visiting a museum necessary? Is a museum born modern? Can you revoke the title of art to some pieces? Has compatibility replaced the specificity? Is the language going on vacation? Does art have something in common or do their similarities overlap? Is there any non-ontological specificity? Is there an economy of care? What mundane events seem magical? Subverting is performing? How does a social transformation begin in the first place? Was Kant the engineer behind the master code of modernity? What has no purpose is empty? Can art renounce its specificity? Is a user a political or aesthetic subject? Is it the aesthetic function of art that makes art? Is talking about art a conceptual unity? Whose sound is the wind? Of the branch or of the wind? Is art its shadow? Is anthropology also fiction? Who are the agents of an official story? Which art is popular? Is popular art important? Is popular art powerful? What has happened in the relationship between art and crafts? What elements are constitutive of the narrative of the historical vanguards? What schizophrenic turns are there in art? Which schizophrenics do I defend at all costs? Do artists know what art is? Is it worthwhile to find out if something is art or not? Can a work of art meet demands? Does the intellectual have obligations or responsibilities? Does the work of art unite things? Is all art poetry? Is poetry surprising? Does falsehood surprise? Do we do contemporary anthropology or anthropology of the contemporary? Who pursues the evidence? Does politics have its own plasticity? A writer who creates content, creates the world or creates the real? Do I recognize the difference between my experience with art and that of others? Are there many contemporaneities? Are there other times apart from the time of modernity? To which father figure do we play to confess those who work in art? When have we been careless in our works in art? How much do we work in art? What should I see in the historically relevant pieces? What is for me the real space, where things happen? Nowadays, what does it mean to subvert? Is seeing the world through a screen an illness? Who are the audiences of art? Is the audience a problem of the institutions? Is a topic popular because of its content or its consumption? Is the tradition of bad taste a tradition built from power? Does the relevance of the murals change after the revolution? Can the idea of art and culture still be changed as industries? How does art regulate a body? How is the circulation of the arts of the body being thematized? Does the image of a performance have something to tell me? Can a concept be resignified if I apply it to my body? What does it mean to inhabit the word? Which signs are more accessible to the body? I look forward to next SITAC. Bruno Enciso Vargas (1995) is a trainee of the degree in Studies and Management of Culture by the Universidad del Claustro de Sor Juana and member of Zona de Desgaste, a collective of philosophy, criticism, and studies on contemporary art. He participates in various projects where he studies and writes about the nature, behavior, and materiality of images, visual culture in contemporary art, grammars of writing specialized in art, the role of curatorship in the present and Mexico City’s art scene. 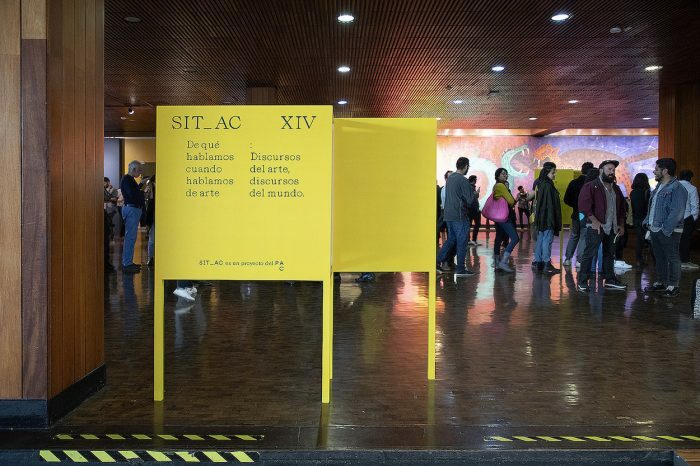 Del 17 al 19 de enero del año corriente se llevó a cabo la XIV edición del Simposio Internacional de Teoría sobre Arte Contemporáneo (SITAC) con sede en el Museo Nacional de Antropología e Historia de la CDMX, bajo el título De qué hablamos cuando hablamos de arte. Discursos del arte, discursos del mundo. Pese a no llevar escritos signos de interrogación, ahí vibra una pregunta. En el texto con el que João Fernandes (director de esta edición) presenta su declaración como convocante, así como en la introducción y conclusiones del evento, se nos invitó a participantes y asistentes a mantener la pregunta abierta. A usarla como excusa para juntarse, pensar, elaborar, re-pensar y re-elaborar tanto sea necesario en torno a la cuestión de la especificidad del arte. Las participantes que tomamos esa excusa, en las mesas o en el público, como observadoras o lectoras, generamos una serie de escenas y conversaciones de las que seguramente habremos tomado aire o arrojado luz sobre algunas de las ideas que nos vinculan al arte a cada una. Aire que refresca o que arrasa. Luz que aclara o que casi quema. La segunda parte del título, aunque ensombrecida, me parece potente también. El auditorio, la dinámica y el formato del simposio fueron un indicador de lo que son los discursos del arte y, a partir de qué discursos del mundo se articularon, a través de las voces varias de las involucradas. No hablo de voces como opiniones subjetivas, sino de tonos, volúmenes y velocidades. 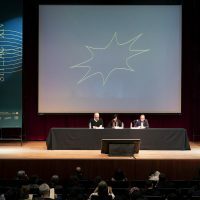 Son discursos del arte y discursos del mundo las conversaciones con colegas o no colegas alrededor del evento, lo son las variables con las que los ponentes leen los textos que han preparado y lo son los rumores que se escuchan mientras nadie tiene la palabra en el micrófono. 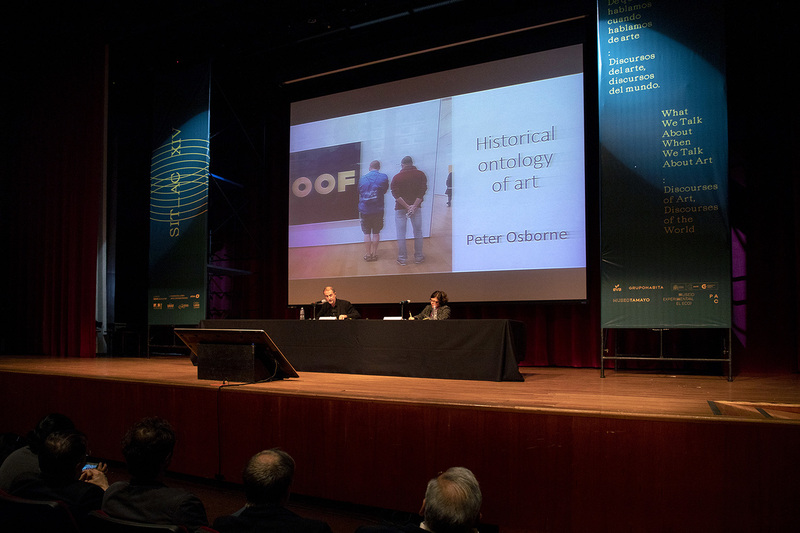 Sobre el evento, pienso: ¿por qué hablamos del arte ahora? ¿por qué hablamos de hablar de arte? ¿es urgente? ¿es importante? Al hablar de esto, ¿Nos convoca la extrañeza, el entusiasmo o la curiosidad? ¿Existe tal cosa como la curiosidad genuina? ¿Esto es un corte de caja? ¿Algo se nos salió de las manos? Y sobre asistir, pienso: ¿por qué fui al SITAC? ¿por qué fuimos todas al SITAC? ¿cuáles discusiones nos excitan? ¿cuáles discusiones traen un sabor que nos es ya muy familiar? Aquí busco extender el juego convocado por el evento en su frágil pretensión de invocar lo más elemental del arte. Por un lado, enlisto a continuación una serie de preguntas que formulé alrededor de cada una de las partes del programa y que considero hacen eco a la pregunta inicial, íntimamente ligadas a las palabras e imágenes que las ponentes usaron. Estas preguntas no son tanto un argumento, sino una suerte de documento de consulta al que podré volver cuando sienta que tenga respuestas o que conviene desdoblar preguntas nuevas; de hecho, a muchas de mis preguntas seguro puede seguirle una más: ¿por qué?. Mantengo el orden horario del programa para evadir momentos involuntarios de énfasis. Por otro lado, sugiero cultivar preguntas propias. A quienes asistieron, revisitar lo visto o lo escrito. A quienes no asistieron, atender el registro de video disponible en el canal de YouTube del Patronato de Arte Contemporáneo para ver o escribir alrededor del asunto. A todas sugiero circular las preguntas propias, las ajenas, deshacerlas, reformularlas y sobre todo dejarlas resonar. A propósito, al Patronato del Arte Contemporáneo (PAC) le reconozco y agradezco ampliamente la organización y realización del evento, pues, además de implicar mucho trabajo, se sostiene de una justificación cultural que se mantiene muy difusa. ¿Qué pienso del título de esta edición? 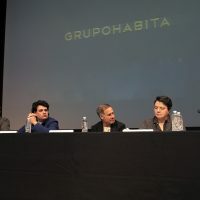 ¿Cómo afecta a un evento sobre arte el inmueble que lo alberga? ¿Qué estarán viendo otras asistentes en el video de la mosca que inauguró el programa ? ¿De qué hablamos cuando hablamos de economía neoliberal en el arte? ¿Qué tipo de presencia tiene una obra de arte ahora? ¿Hay una crisis de los discursos críticos? ¿Cuáles discursos críticos conozco? ¿Qué les hace críticos? ¿Podría mi interpretación del arte ir más allá de mi formación? ¿Puede una obra de arte cuestionar un circuito ideológico? ¿Qué contamina una obra de arte? ¿Es posible estar juntos y no hacer nada? ¿Lo que es singular y específico es libre o radical? ¿Puede el arte ser no-intencional? ¿Es la historia del arte una ficción o un modelo de uso? ¿Una colaboración ha de ser necesariamente leída como gesto de resistencia? Disclaimer: Osbourne advirtió que de su ponencia no podríamos extraer conceptos plenamente explicativos. ¿Puede haber algo no-histórico? ¿Qué se enseña en las escuelas de arte? ¿En las escuelas de arte enseñan a constituir ontológicamente a los objetos? ¿Es el arte un concepto histórico-ontológico? ¿Es el arte un concepto transdisciplinar? ¿Es el arte un concepto crítico? ¿Es el arte multiplicidad? ¿Qué articula el arte? ¿Constituir es coproducir? ¿Cómo negociar entre la multiplicidad y su unidad? ¿En qué consiste juzgar? ¿Es lo mismo juzgar que valorar? ¿La contemporaneidad implica un estado de crisis? ¿Cuál es la imaginería post-capitalista de la que participamos? ¿Puede el arte reclamar su independencia social? ¿Se resiste el arte a ser funcional? ¿Es el arte disfuncional? ¿Tiene el arte sus propias reglas? ¿La experiencia del arte es el arte? ¿El arte se experimenta en imágenes? ¿Cuál es la relación entre arte y filosofía? ¿Una crítica es crítica de la realidad o sólo de un discurso? ¿Cuáles posibilidades sobre el arte se pueden ensanchar? ¿Qué distingue a la teoría crítica de la filosofía? ¿Qué distingue a la crítica de arte de otras escrituras sobre arte? ¿Preguntar por algo específico es buscar una salida? ¿El crítico es un estratega? ¿Cuáles objetos de mis investigaciones estoy desdoblando y a cuáles les estoy haciendo una apología? ¿Lo artístico encuentra terrenos más fecundos fuera del mundo del arte? ¿Tematizar un asunto es volverlo público? ¿El mundo del arte es regido únicamente por principios discursivos? ¿Qué se gana anunciando que ya no podemos hablar de un arte en general? En la búsqueda de la especificidad del arte, ¿buscamos algo muy grande o muy chiquito? ¿Qué escribe un artista? Para hablar de arte, ¿es posible un disclaimer moral permanente? ¿El artista legitima al crítico o es a la inversa? ¿Cómo actualizamos obras que fueron importantes en el pasado para este presente? ¿Cómo convive la forma estética de una obra arte con su forma social? ¿Fue la obra crítica de Walter Benjamin una bomba? ¿Lo inorgánico es glamoroso? ¿Está apuesta a la pregunta sobre el arte en si pertenece o no a un círculo? ¿Cómo se coloca el arte frente a la mirada? ¿Circulan libres los sentidos o están presos a las significaciones? ¿La negatividad nubla o complejiza? ¿Es el arte un pésimo promotor político? ¿Es el arte el heraldo de un mensaje imposible? ¿El arte ha cuestionado todos los límites? ¿Es el arte entonces una intención que se desborda? ¿Es el arte un prestanombres? ¿El arte expande lo real? ¿Es el arte escasamente verificable? ¿Qué ha sido del discurso moderno? ¿Se ha transformado la transición en tradición? ¿Lo que es mediáticamente reprobable es más memorable? ¿Cultura y anestesia social son sinónimas? ¿El realismo absoluto funda una ceguera indiscernible? ¿Es el arte un sistema de afectaciones? ¿Es el arte una máquina de proposiciones simbólicas? ¿El arte es un hipotético? ¿Existe el abuso visual? ¿Puede una institución artística desmoronarse? ¿Puede un modelo de exhibición ser crítico? ¿Puede quejarse? ¿Puede una obra de arte anestesiarnos? ¿Cuál arte contemplo, cuál arte estudio y cuál arte repudio? ¿Un museo puede ser un archivo? ¿Puede un museo asumirse como un templo? ¿Es el museo un punto de reunión? ¿Un museo purifica? ¿Visitar un museo es necesario? ¿Un museo nace moderno? 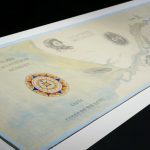 ¿Se puede revocar el título de arte a algunas piezas? ¿La compatibilidad ha sustituido a la especificidad? ¿El lenguaje se va de vacaciones? ¿El arte tiene algo en común o se sobreponen sus similaridades? ¿Hay alguna especificidad no-ontológica? ¿Existe una economía de la atención? ¿Qué eventos mundanos parecen mágicos? 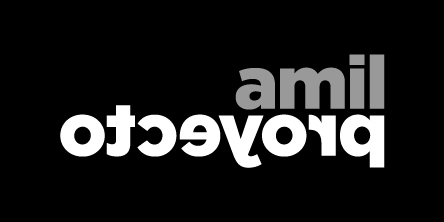 ¿Subvertir es performar? ¿Cómo comienza una transformación social en primer lugar? ¿Fue Kant el ingeniero detrás del código maestro de la modernidad? ¿Lo que no tiene propósito está vacío? ¿El arte puede renunciar a su especificidad? ¿Un usuario es un sujeto político o estético? ¿Es la función estética del arte la que la vuelve arte? ¿Hablar de arte es sostener una unidad conceptual? ¿De quién es el sonido del viento? ¿De la rama o del viento? ¿El arte es su sombra? ¿La antropología también es ficción? ¿Quiénes son agentes de una historia oficial? ¿Cuál arte es popular? ¿El arte popular es importante? ¿El arte popular es poderoso? ¿Qué ha pasado en la relación de arte y artesanía? ¿Qué elementos son constitutivos de la épica de las vanguardias históricas? ¿Cuáles giros esquizofrénicos hay en el arte? ¿A cuáles esquizofrénicos defiendo a ultranza? ¿Los artistas saben lo que es arte? ¿Vale la pena averiguar si algo es arte o no? ¿Puede una obra de arte atender demandas? ¿El intelectual tiene obligaciones o responsabilidades? ¿La obra de arte une cosas? ¿Todo el arte es poesía? ¿La poesía sorprende? ¿La falsedad sorprende? ¿Hacemos antropología contemporánea o antropología de lo contemporáneo? ¿Quién persigue la evidencia? ¿La política tiene su propia plasticidad? ¿Un escritor que crea contenido, crea el mundo o crea lo real? ¿Reconozco una diferencia entre mi experiencia con el arte y la de otrxs? ¿Hay muchas contemporaneidades? ¿Hay otros tiempos aparte del tiempo de la modernidad? ¿Ante cuál figura paterna jugamos a confesarnos quienes trabajamos en arte? ¿Cuándo hemos sido descuidadxs en nuestros trabajos en arte? ¿Cuánto trabajamos en el arte? ¿Qué debo ver en las piezas históricamente relevantes? ¿Cuál es para mí el espacio real, donde las cosas pasan? Hoy en día, ¿qué significa subvertir? ¿Ver el mundo a través de una pantalla es una enfermedad? 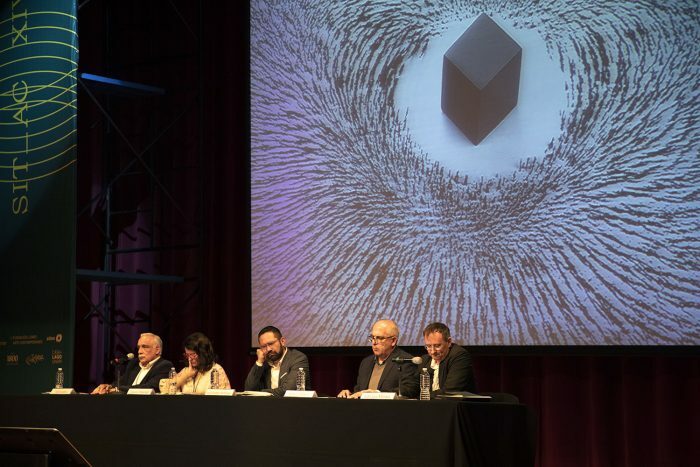 ¿Quiénes son las audiencias del arte? ¿Es la audiencia un problema de las instituciones? ¿Un tema es popular por su contenido o por su consumo? ¿La tradición del mal gusto es una tradición construida desde el poder? ¿La relevancia de los murales cambia luego de la revolución? 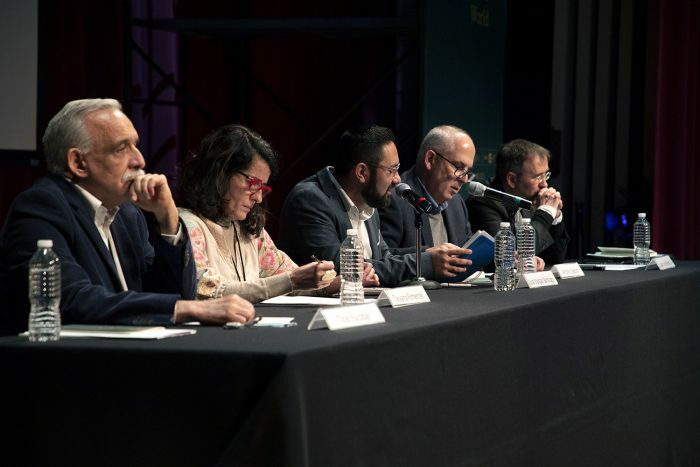 ¿Aún puede cambiarse la idea del arte y la cultura como industrias? ¿Cómo regula el arte un cuerpo? ¿Cómo se está tematizando la circulación de las artes del cuerpo? ¿La imagen de un performance tiene algo que decirme? ¿Puede un concepto resignificarse si lo aplico a mi cuerpo? ¿Qué implica habitar la palabra? ¿Cuáles signos son más accesibles para el cuerpo? Espero atento el próximo SITAC. Bruno Enciso Vargas (1995) es pasante de la licenciatura en Estudios y Gestión de la Cultura por la Universidad del Claustro de Sor Juana y miembro de Zona de Desgaste, colectivo de filosofía, crítica y estudios sobre arte contemporáneo. Participa de diversos proyectos donde estudia y escribe alrededor de la naturaleza, comportamiento y materialidad de las imágenes, la cultura visual en el arte contemporáneo, gramáticas de escritura especializada en arte, la función de la curaduría en la actualidad y la escena artística de la CDMX.